Yonah Schiller is the rabbi who came to Tulane Hillel ten years ago, saw what was and what wasn’t happening there, and set out to change the situation, one unaffiliated Jewish student at a time. His results have been dramatic. Today Hillel reaches more than ninety percent of the Jewish students at Tulane and an impressive forty-five percent of the student body as a whole each year; he’s more than tripled the operating budget; and he is now working with over a dozen universities and various organizations across the country to share best practices. He did this by recruiting and by inspiring students across the Jewish spectrum to serve in leadership positions—he disbanded Hillel’s student leadership board and gave leadership roles to more than three hundred students who typically were not Hillel leaders or participants. Creative programming also played a major role. Students are encouraged to propose and launch their own programming ideas and are given mini-grants to realize these initiatives. Along the way, Schiller earned his MBA, and odds are he is one of the few rabbis around who describes his results using terms such as “barometers of success,” “market share,” “penetration,” and “demographics.” Among the many accolades Schiller has earned is being named by the Forward as one of the 50 most influential American Jews in 2017. 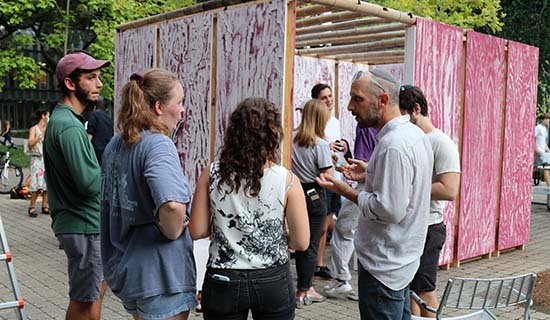 “Talking With…” introduced in this post, features conversations with Targum Shlishi’s grantees and with people of interest. Targum Shlishi: What led you to become a rabbi? Was it something you planned for and prepared for since you were young? Yonah Schiller: Actually, becoming a rabbi wasn’t part of the plan. But I found myself more and more engaged in Jewish learning, and I was very interested in it and found it compelling. I started studying in college, but it was mostly after college when I wound up investing significant amounts of time in my studies. Somewhere in that process the idea of being a rabbi arose. It seemed like a logical step. I was already studying in such depth…and plus, I needed a job! TS: What attracted you to this position at Tulane Hillel? YS: I had realized that in the Jewish American landscape, most Jewish institutions in my generation had not been wildly effective at engaging a broad demographic. There was a culture around Jewish organizations that created and inside-outside split. As I became more involved in Jewish learning, that rift became glaringly obvious and also disturbing. TS: What was your background with these organizations? Were you involved in Jewish institutions such as Hillel when you were younger? YS: I was raised in a proud Jewish home that was mainly culturally affiliated. There was not a significant religious connection. As I forged my path, my Jewish life became much more robust. The Hillel platform was intriguing to me since it is dealing with a demographic of young people who are still forming their Jewish identities and asking questions. I saw Hillel and particularly I saw college as a great environment in which to explore the significance or relevance of Jewish life. TS: When you took the position at Tulane Hillel, it was not thriving. Can you comment on that? YS: Tulane Hillel was not atypical of Hillels on campus. At Tulane, there is a large population of Jewish students [Jewish student enrollment at Tulane is approximately three thousand students]. Our barometers of what we felt was successful was not very high. Our market share of engaging Jewish people and how deeply or not deeply we were penetrating those broad demographics was underwhelming. This was not specific to our organization but consistent with national trends. We know from Pew report [“A Portrait of Jewish Americans,” Pew Research Center, 2013, 214 pages] and other national studies that organized Jewish life is not on the rise. Considering the talent, creativity, resources and general amazingness of the Jewish people as a broad demographic, the lack of communal engagement just does not seem to make sense. We must be doing something wrong—there must be options for better outcomes. TS: Where and how did you start? TS: Once you had framed the question, how did you approach Hillel and building a bigger and different audience? YS: The greatest thing I carried with me coming into the situation, me as a user of Jewish life, is that many people I know and many of my friends basically experience Jewish organizations as not speaking to them or for them, and does not provide value to their lives. What I focused on was how Tulane Hillel might be able shift to better deliver for the Jewish students here; their needs, their passions, and identities. TS: You made major progress very quickly. It seems like you hit the ground running. Were you following a model? Did you have a strategy from the outset? YS: It’s true, we hit the ground running. I didn’t have a specific model but more of a mindset. We did make some dramatic changes after the first year. That said, for the first year I did a lot of observing and made very few changes. I was interested in looking at what was working and what was not working. It was a pretty intensive time of listening and learning to a very broad spectrum of the population. Listening and honoring those voices provided some very quick insights that led to the changes we then made. The people who were already engaged in our world. We were expanding the chorus of voices and in doing so, we were giving people permission to think that Jewish life can be relevant for them. We brought a tremendous amount of optimism and possibility to all of this. I think that extreme optimism was a new perspective for people. And people responded. The beauty of it was, who doesn’t want that? Everyone is energized when thinking about what is possible. We were able to reach students, their parents, young alumni, and the Tulane administration. We were creating a platform that was inclusive and empowering. The greatest unintended consequence was that the momentum was much quicker than we anticipated. The momentum was what made it all grow so quickly. It was like turning on a faucet. TS: Did it take a lot of resources and expense to make the changes you did? YS: There are a lot of programs out there, heavily funded, where we pay students essentially to get involved and get others involved. We found was that this was not only not necessary, but those kinds of resources could be re-allocated to have even greater impact. We had initially spent so much money on things that were having only an incremental impact, at best. Many of the hundred-plus student ideas launched each year do not have a big price tag. The momentum of activity and participation had a directly correlated relationship to our increased fundraising capabilities. This is not always a good thing, but funders and contributors want to invest in winning teams. TS: Along the way, you went back to school for your MBA. Not knowing the statistics, it seems safe to assume that not many rabbis have MBAs What led you down that path? YS: I think that I’m a pragmatic spiritualist. My rabbinic training in Israel was over an eight-year period, an intensive and focused spiritual deep dive. Yet, it was unique in that the question of how to apply that experience in the real world was always at the forefront. I think a major challenge for rabbis today is how best to “translate” our learning, teachings, and practices for us to achieve relevance and resonance for our people. The MBA was an opportunity for another lens through which our tradition and perspective of the world can find expression. And sort of the underbelly of professional Jewish life is that all Jewish organizations are businesses. At Hillel, we are running a small business. And these are skills they don’t teach you in rabbinical school. For me the MBA was a great opportunity to add to some other formal skillsets. TS: What are some recent highlights that have come out of this work? YS: A big highlight is that we had a strong intuition that the work we were doing was not specific to New Orleans or Tulane or even Hillel. We are now engaged in a process to share what we are doing and distill out what is universal. We have formalized it as the Organizational Design Lab, and our goal is to share our methodology and approach and mindset. We began with a cohort of eight Hillels from other universities with the plan to work with them for a few years, and the results have been very positive. The second cohort began in the past year, so we are now working with sixteen Hillels. A report is coming out in January that will be able to better articulate the approach and impact. We are now in conversations to create similar cohorts and organizational change efforts with a spectrum of Jewish organizations and Foundations. 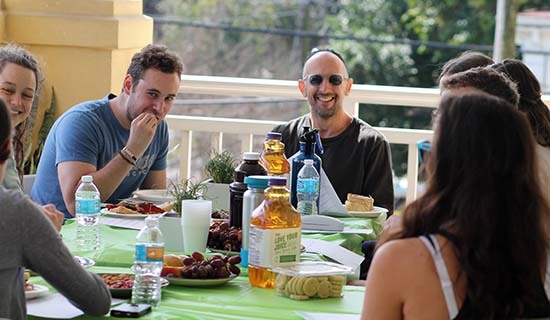 We have found that our work at Tulane Hillel is highly adaptable and can be customized. If organizations are committed to engaging in a rigorous but very energizing and potentially transformative process, then there is a lot of potential. TS: What keeps you inspired in this work? YS: I am still very curious about how much there is to learn from our people, their needs and wants. When we talk about “the Jewish people,” I take those words seriously. The entirety of the Jewish people can and should be involved in defining our future and our communal identity. Its been very inspiring to work with professionals, in and out of the Jewish world, who understand and are incredibly excited about the prospect for Jewish life to evolve with a quickly changing world. There is just so much potential. I find that incredibly inspiring.